I am offering my copy of this book in a giveaway as I have such an abundance of wonderful resources, I want to be sure to bless someone else with a copy. This book starts with a 25 page introduction, valuable information on the whys of eating homegrown. From the Health stance, nutrition differences, the quality of the food, and its sustainability. In addition, she touches on the frugalness of eating home grown and finding pride in ones work. Very good information on chemicals and how much of the food we eat today is extremely unhealthy for us. The book is divided into 5 parts, each with a Planning, Growing, and Cooking sections. Backyard gardening is first with helpful hints on planning a garden that fits nicely into the space you have, and not becoming overwhelmed. To plan according to your future needs and utilizing the fruits of your labor. The orchard is next with the ins and outs of planting, and when and how of harvesting then making delicious jams and other recipes with your fruit. Caring for poultry for both eggs and meat production. Includes housing recommendations and types of poultry. Of course my favorite, your home dairy! From planning on which livestock, caring for them, to processing your milk into cheese and soap. 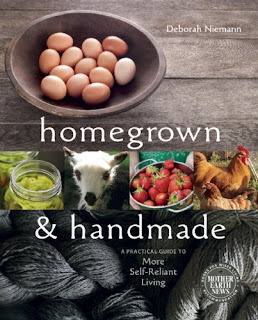 She even includes a section on raising fiber animals! Covers all the basics and is a great resource for helping someone get started with farming, even in their small backyard. The only thing I had wished was that the pictures would be in color, but I know that isn’t always practical either. Great book, a great starter, but includes enough depth for even seasoned farmers to utilize the information. Thanks to the Author for providing me with a copy of the book in exchange for an honest review. LOVE IT! Sounds like something I could learn from. I've been trying to talk the fiance into getting us a milking goat so we can have fresh milk, butter, cheese, yogurt and all that yummy stuff! This sounds like a great book. I grow my own vegetables and herbs in the summer because it feels so good to eat something that you grew and it is so much more economical. This would be a great book to share with family after reading it. Awesome! My dream is to be self-sufficient some day. Please count me in. Thank you!